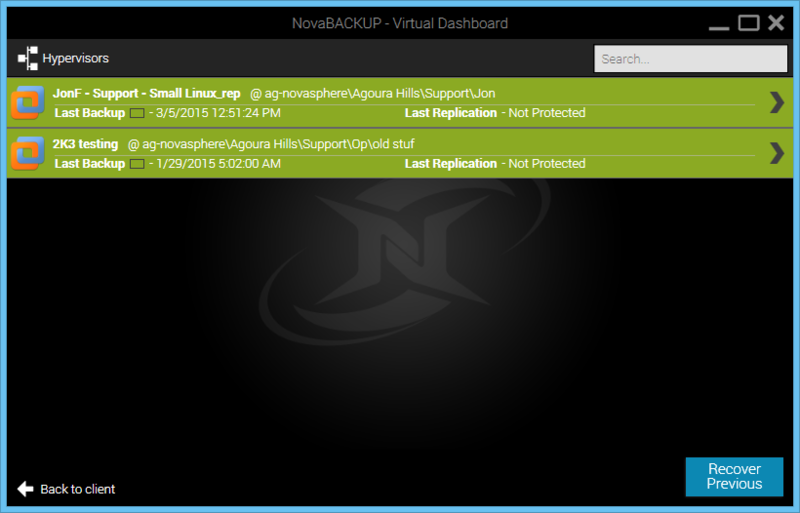 Using NovaBACKUP Business Essentials software to restore a single file from a Virtual Machine backup is very easy. This guide is meant to explain step-by-step how to restore single files or folders from a VMware VM backup utilizing NovaBACKUP’s Virtual Dashboard feature. 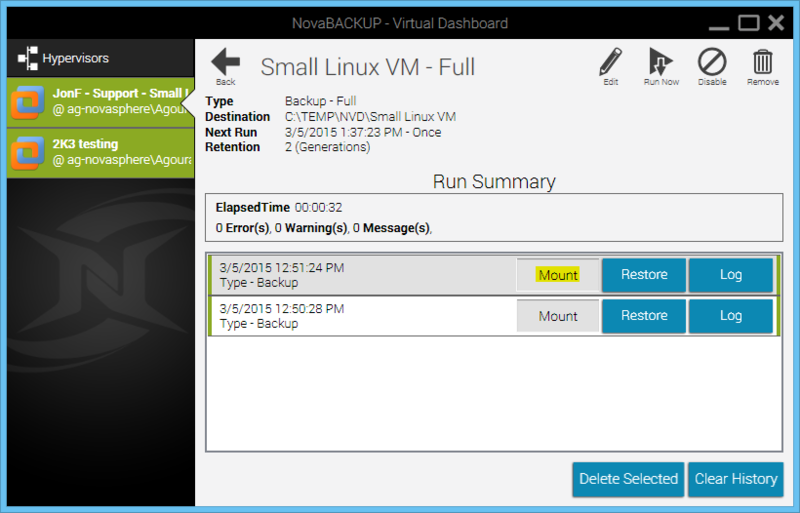 To get started you will first be required to create a backup job for your VMware VM in NovaBACKUP’s Virtual Dashboard function. 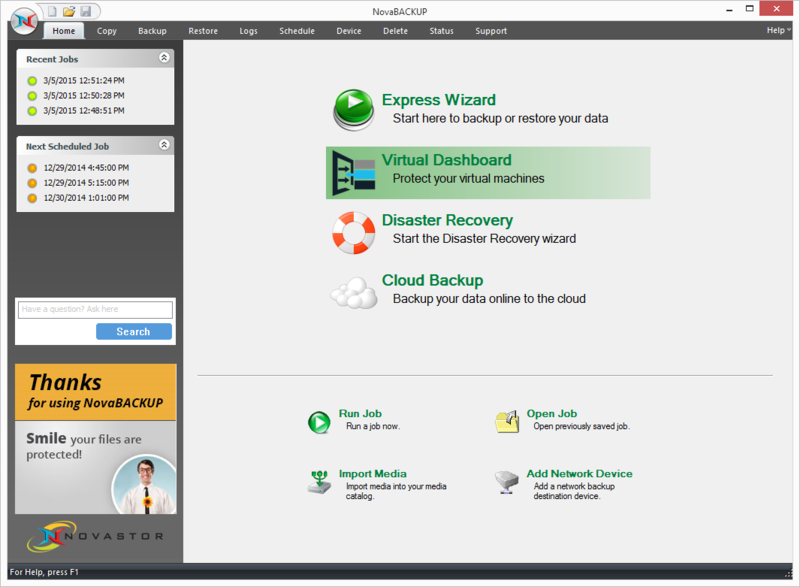 The Virtual Dashboard feature is included in the NovaBACKUP Business Essentials software. We have written a guide on how to create the VMware VM backup jobs which takes you step-by-step through the process located in our Knowledge Base. That article is here. The first step would be to start NovaBACKUP Business Essentials and from the Home tab click on the “Virtual Dashboard” function as shown in the screen below. Once the Virtual Dashboard function is on the screen, and you have created at least one backup job for your VMware based Virtual Machine(s), you will see a list of the VMware Virtual Machines which you have created backup jobs for. This is shown in the screen below. 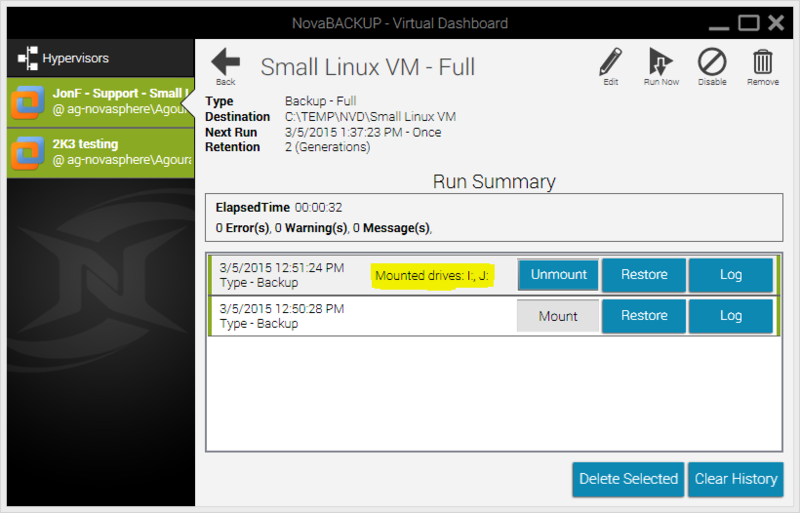 To restore a single file from a Virtual Machine backup which has already completed, whether that be a Full Backup or Incremental/Differential Backup, you will first select from the list the Virtual Machine which contains at least one completed backup and you will see a button to click on labeled “Mount”. This is shown in the screen below. If the VMware backup which you are mounting contained two partitions/volumes as part of the backup then the mount function will mount all of the volumes inside the backup to that number of drive letters for each volume and inform you on screen which drive letters are assigned at the time of mounting the backup set. This is shown in the screen below. When you are finished restoring single files you will want to un-mount the currently mounted backup set to release the drive letters. To un-mount all of the currently mounted volumes contained in this backup set which we mounted earlier you will click the “Unmount” button. The "Unmount" function will release all of the mounted drive letters. This is shown in the screen below. 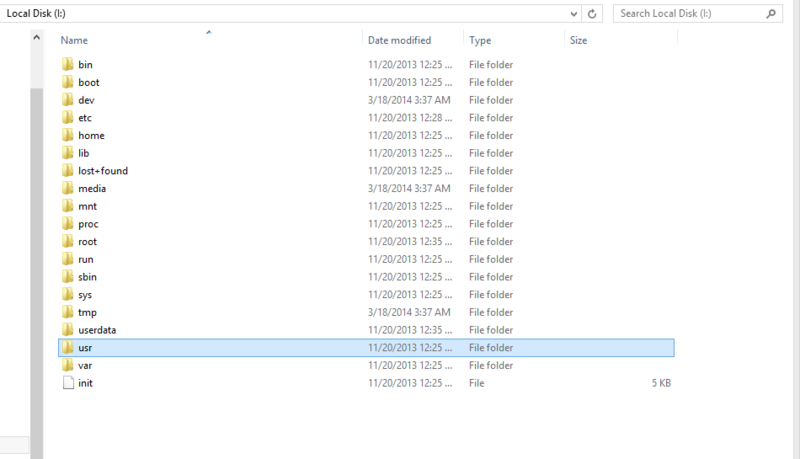 This concludes the guide on How to restore a single file from a VMware VM backup.